Ms. Chaney talks to teens about the importance of healthy foods and the growing urban agriculture movement. The topic for the March Atlanta Teen Science Café was urban agriculture. Our speaker Ms. Lotus Chaney of Garden Glow Wellness, defined urban agriculture and how it is important for metropolitan areas to have urban gardens and other green spaces in communities. Urban agriculture helps improve social and emotional well-being of individuals and communities. Urban agriculture is an interdisciplinary real world application of STEM. Our speaker Ms. Chaney doesn’t have a STEM background; however she got into the field of urban agriculture because of her love of cooking, healthy eating and memories of her family having gardens in their backyards. 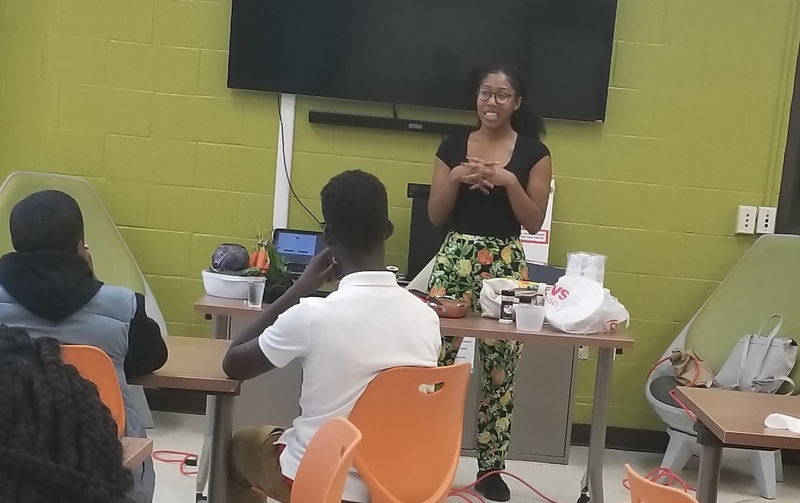 The students really enjoyed learning about her journey to become a garden educator, as a member of the Food Corps and using that experience to transition to a career as an entrepreneur. Ms. Chaney discussed how urban agriculture allows communities to have access to healthy foods at affordable prices through community and school gardens and local farmers markets. Urban agriculture also solves issues of food insecurity in areas that are food deserts. Urban gardens and farmers markets allows schools, programs and local farmers to earn money and stimulate the local economy. Urban gardens, especially those at schools, provide opportunities for students to learn about plants, meteorology, soil, insects and nutrition. As a garden educator, Ms. Chaney taught the students about and had examples of the produce that can easily be grown in gardens as well as simple recipes that can be made with various produce. The coolest thing that about the café was the discussion about the colors of vegetables and how each color represents different nutrients that you need for good health and disease prevention. Ms. Chaney spoke about how it is important to consume as much fresh produce in your diet as possible and consume a rainbow of fruits and vegetables. For the hands on demonstration, Ms. Chaney did a cooking demonstration where she made a vegetable stir-fry with carrots, purple cabbage and zucchini; all vegetables that can be easily be grown in a community, home or school garden. 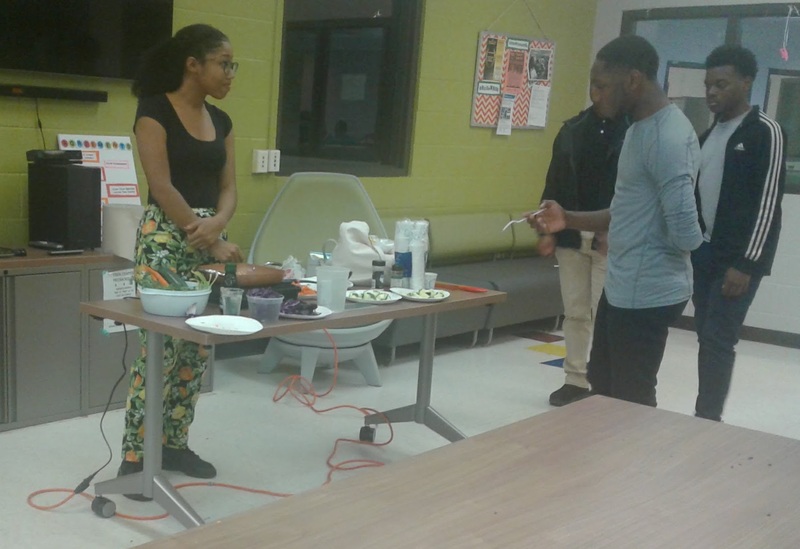 The students chopped the vegetables for the stir fry and had more discussions about urban agriculture while Ms. Chaney was making the stir fry. At the end of the café, the students enjoyed a healthy snack.